SYDNEY, Australia – February 24, 2009 – Altium continues to make it easy for electronic designers to take advantage of programmable hardware. The company has announced another new daughter board for its desktop NanoBoard reconfigurable hardware development platform. 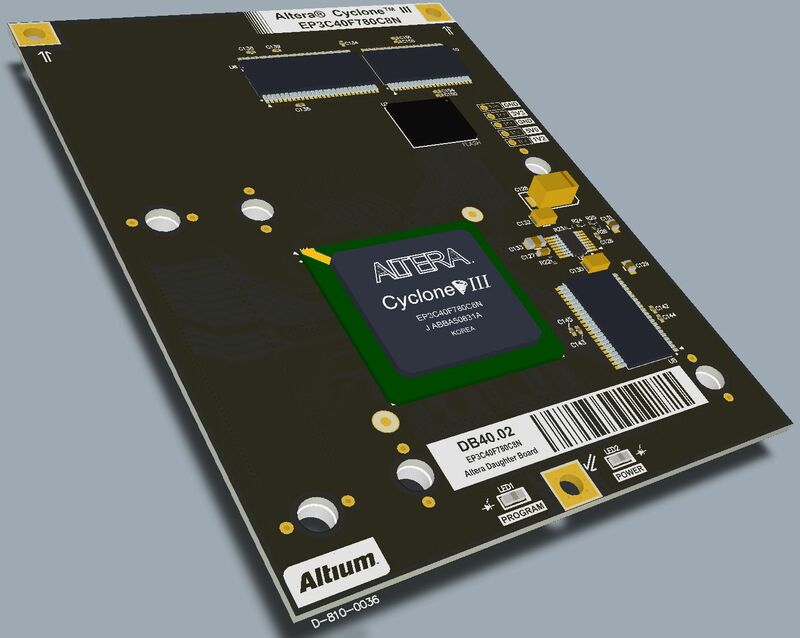 This latest plug-in daughter board targets Altera’s low-cost Cyclone® III EP3C40 FPGA in a 780 BGA package. The daughter board includes a range of on-board memories for application use and a 1-Wire memory device used to store board identification and related information. The desktop NanoBoard lets electronics designers use the flexibility and inherent ability to reprogram FPGAs to create new designs quickly, and then compare design performance across a range of different FPGA devices supported by Altium. The Altera Cyclone III FPGA plug-in daughter board offers more opportunities for electronics engineers to experiment with different programmable devices, particularly in mainstream electronics design. Designers don’t need to commit to their final device too early in the design cycle. For example, they have the option of creating their design using one FPGA, and choosing another device for their final product. Designers can also observe the performance of an actual design running on the NanoBoard, and compare it with other devices simply by swapping daughter boards and rebooting in seconds. When the desktop NanoBoard is combined with Altium’s unified electronics design solution, Altium Designer, designers have an Innovation Station that lets them create prototypes in a matter of days rather than weeks, optimize product performance and overall cost in their designs, and create a sustainable competitive advantage embedded within the design. Altium Designer’s unified design environment also lets designers lay out custom PCBs once the design is final. It manages all the design documentation required to take the design through the complete design process: early concept development; multiple prototypes creation on the desktop NanoBoard; custom 3D PCB design, including dynamic clearance checking between the PCB and its casing; final output files for manufacturing. Every designer on a project accesses a single design data model, can see the changes in the design as they happen, and can update versions and associated documentation with a single command. "Our partnership with Altium ensures our mutual customers have a solid methodology to develop designs based on Altera FPGAs," said Chris Balough, senior director of software, embedded, and DSP marketing at Altera. "The addition of a Cyclone III FPGA daughter board within Altium's NanoBoard platform ensures designers can quickly and easily integrate our low-cost, low-power, high-functionality Cyclone III FPGAs into their systems." Altium Designer and Altium's desktop NanoBoard, which comes standard with a choice of one FPGA daughter board, are available from Altium's Sales & Support centers at www.altium.com/contact-us, or as the Innovation Station from Digi-Key at www.digikey.com. http://www.altium.com/Products/TheNanoBoard/ or watch the Innovation Station video at Altium's INFOcenter at www.altium.com. Altium Limited (ASX:ALU) provides next generation electronics design solutions that break down the barriers to innovation. Altium’s solutions are unique because they unify the separate processes of electronics design, all within a single electronics design environment, working off a single data model, linking all aspects of electronics product design into one process. This unified design environment helps electronics designers easily harness the latest devices and technologies, manage their projects across broad design ‘ecosystems’, and create connected, intelligent designs. Founded in 1985, Altium has headquarters in Sydney, sales offices in the United States, Europe, Japan, China, and resellers in all other major markets. For more information, visit www.altium.com. Altium, Altium Designer, and LiveDesign, and their respective logos are trademarks or registered trademarks of Altium Limited or its subsidiaries. All other registered or unregistered trademarks mentioned herein are the property of their respective owners, and no trademark rights to the same are claimed.